I was born in Elk City in Western Oklahoma and lived there until I was three when we moved to the Gulf Coast of Texas. My dad worked for an oil refinery construction company and we moved just about every year until I was in the seventh grade. We had a trailer house that we pulled around all over the country behind our car, so we always had our own beds right with us. We lived in a lot of different places in the states of Oklahoma, Texas, Kentucky, Mississippi, West Virginia, and Arkansas. After I was grown, I also lived in many other places, including Shreveport and Haughton, Louisiana; Naperville and Chicago, Illinois; and two towns in Vermont, but the state where I have resided in the greatest number of towns is Texas: La Porte, Beaumont, El Paso, Nederland, Texarkana, Wake Village, Arlington, Carrollton, and Weatherford. By the time I was 23 I had experienced 23 major changes in my life, so I got very accustomed to having to say goodbye to my old friends and make new ones. One thing I learned about that, though, was it never got any easier. When I was young, my dad’s parents lived on a farm in Washita County, Oklahoma, and my mother’s family in Dumas, Texas, so Highway 66 between Oklahoma and the Texas Panhandle was one of the first roads I remember. In fact, I was born on Highway 66; it ran right through the middle of Elk City, Oklahoma. I guess if a person was born on Highway 66, she may be destined to love travel. Now, I travel whenever I get the chance. So far, I’ve been to all of the Lower 48 states, Mexico, Canada, the Bahamas, England (& Scotland & Wales), France, Andorra, Spain, Portugal, Italy, Vatican City, Ethiopia, Costa Rica, Brazil, Argentina, and Ecuador. But I’m just beginning; there are so many more places to see! I love drawing and painting and hope to spend more time in the years to come working on my art. When I was five, when asked what I wanted to be when I grew up, I’d answer, “A cartoonist,” and for years I drew pictures and planned to become an artist. I studied art in college, in fact, but I also loved biology (and studied it, too). Eventually, after moving around and studying at three other colleges, I got a psychology degree from East Texas State University in Texarkana (now TAMU-Texarkana, a branch of Texas A & M), so, albeit inadvertently, I guess I’ve become an Aggie. Later in life, I studied writing in Vermont College’s MFA in Writing. I still love working in clay and still see it as a metaphor for writing and revision. The forgiveness and pliability of clay give me a way to see my stories—until they are published and are, in effect, fired in the kiln. I confess, though, that occasionally when reading from published work, I make revisions as I go along. I don’t mind when that happens because it means that I am continuing to grow and learn, developing my inner ear as a writer and my intuition and wisdom as a person. In the years ahead, I hope I am going to keep becoming the person I need to become in order to write the stories and poems that I need to write. I believe that happens with writers—growth into the people they are capable of becoming—and I look forward to the surprises ahead, the stories and characters I don’t even have a glimmer of an idea about—at least, not yet. 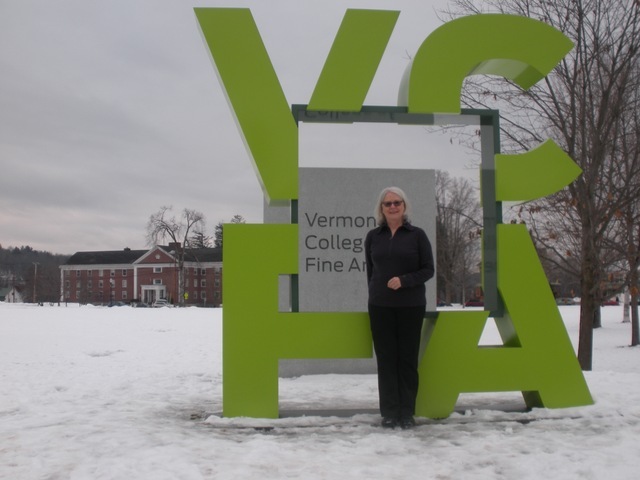 SHARON DARROW was on the faculty of Vermont College’s MFA in Writing for Children and Young Adults from 1997 to 2018 and at Columbia College Chicago (1996-2003). She continues to teach in VCFA residencies from time to time and to participate in school visits and writers' conferences. IN THE MIDDLE OF THE MIDDLE-WEST: AN ANTHOLOGY OF CREATIVE NON-FICTION (Fall 2003), Indiana University. The DARROW LECTURE SERIES, named in her honor, is held annually in Montpelier, Vermont, with lectures delivered by distinguished authors who are graduates of the MFA in Writing for Children and Young Adults program of Vermont College of Fine Arts.